A Kochi-based firm launched what it claimed was India's first multi-platform auto fare calculating application that uses GPS. 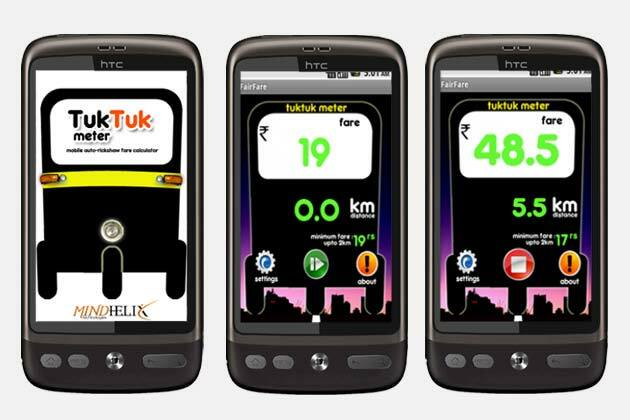 MindHelix Technologies claimed that its "Tuk Tuk" metre, a mobile phone application, will enable the commuter to get accurate fare from auto-rickshaws. The app will help commuters from being cheated by false fare claims. The meter is the first multi-platform application in India that can dynamically calculate the distance travelled using Global Positioning System (GPS) and the fare due, a company official said. The space-based GPS satellite navigation system, provides precise location and time information anytime anywhere on Earth. The system, developed by the United States Department of Defence, is freely accessible by anyone with a GPS receiver. The new application runs on smartphones with Android, Blackberry or Symbian operating systems without any need for manual entry of distance or fare. It can be downloaded free from www.tuktuk.mindhelix.com, Christin Emmanuel George, co-founder and CEO of MindHelix Technologies, said. It can be started as one enters the autorickshaw and the meter in the phone will run alongside the auto's metre. Using the GPS, it can double-check the distance travelled as shown in the auto and calculate the exact fare, explained George. "The 'Tuk Tuk' meter does not require an internet connection or service provider. It functions even in remote areas. The application has a simple user interface that consists of a Start-Stop button and can be customised for any location by entering the fare details," George said. MindHelix Technologies is a start-up company formed in December 2010. The company focuses on mobile applications development.